The December observations (pdf 0.84 Mb) of the Bárðarbunga seismic and volcanic events are given here with daily notes, factsheets and additional material. Information, day by day, is given in reversed order. In combination, the monthly articles give an overview of events: August, September, October, November, December, January, February, March-April-May and the overview article (list of links). Below is a calender with a short-cut to each day of this month. Of interest: Comparison with historic eruptions. First 100 days of eruption and gas release. Four months of gradually fading activity. Panoramic view towards the eruptive site in Holuhraun 3rd September 2014. Photo: Richard Yeo. About 45 earthquakes have been detected in and around Bárðarbunga since yesterday morning. The largest was M4.7 at 20:54 (30 Dec). Seismic activity continues in a similar fashion in the northwestern Vatnajökull area with a series of small quakes around Tungnafellsjökull and Herðubreiðartögl. A few small ones were also detected in the dyke intrusion. Two days ago, difficulties in approaching the lava led to doubts about the newest estimate of its size. The Institute of Earth Sciences has now confirmed that the lava is almost 83 km², see map (enlarge). Insubstantial changes have been in the volcanic eruption in Holuhraun over the last few weeks. The lava is now flowing inside a closed channel to the eastern edge of the lava field, about 15 km from the crater. Lava is also running to the north. Notes from the meeting of the Scientific Advisory Board (pdf 0.4 Mb). The two largest earthquakes in Bárðarbunga the last 24 hours occurred 14:32 yesterday, M4.4 and 00:11, M5.3. Two more earthquakes around M4.0 were also detected and eight between M3.0 and M4.0. In total ca 40 earthquakes have been detected in Bárðarbunga the last 24 hours. Three earthquakes, M4.0 and larger, have been detected in Bárðarbunga since 12:00 yesterday (28 Dec.). The largest one, M4.1 occurred at 7:14, another, M4.0 at 18:11 and the third, M4.0 at 09:45 this morning. Ca 15 earthquakes between M3 and M4 were detected in Bárðarbunga. Yesterday evening at 23:18 an earthquake M4.4 was detected in the ocean, ca 20 km north of Kolbeinsey and some smaller followed. Similar pattern is common in the area. The lava almost 83 square kilometers? An overview map last midnight (28 - 29 Dec.). The lava was estimated 82,8 km² (82,4 km² + 0,4 km²); possibly an overestimate. A field excursion on the 28th, organised from Húsavík, measured the whole length of the northern margin at 5 - 20 km distance but in places it was impossible to be so close and they had to make loops even farther away. Enlarge. Institute of Earth Sciences. The two largest earthquakes in Bárðarbunga past 24 hours were of magnitude 4.6 at 14:49 yesterday and 07:23 this morning. Additionally, there were three quakes over magnitude 4 and 12 between 3 and 4. In total over 40 quakes were observed in Bárðarbunga. Four quakes were observed in the dyke intrusion, all below magnitude 1. Seven quakes were observed in the Tungnafellsjökull area, the largest of magnitude 2.5. Good visibility has been on web cameras over the eruption site yesterday and today. Only one earthquake over magnitude 4 occurred since noon yesterday, magnitude 4.4 in the southern caldera rim at 05:37. Almost ten quakes were between magnitude 3 and 4. In total, 35 quakes have been observed during the past 24 hours. In the dyke intrusion, 10 quakes were observed, all below magnitude 2. In Tungnafellsjökull area ten quakes were observed, all also below magnitude 2. Clear view has been of the eruption site through web cameras this morning and yesterday. The earthquakes in the Geysir area seem to be fading out. Since noon yesterday only five quakes have been observed, all below magnitude 1.5. The largest earthquake in Bárðarbunga since noon yesterday was of magnitude 5.0 at 22:53 yesterday originating in the northern caldera rim. No quake was between magnitude 4 and 5, but about seven quakes between 3 and 4. In total about 40 quakes have been observed in Bárðarbunga during this period. Five quakes were observed in the intrusion, all under magnitude 2. Earthquakes continue in the area about 10 km north of Geysir. Almost 30 quakes were observed there during the past 24 hours, there of about 10 since midnight. The largest was of magnitude 2.5 at 12:45 yesterday. The new earthquake sequence, located about 10 km north of Geysir geothermal field (south of Langjökull), continues. This morning at 05:58 an earthquake 3.2 in magnitude occurred. It was felt at Geysir in Haukadalur, in Miðdalur east of Laugarvatn, and at Syðri-Reykir in Biskupstungur. Since noon yesterday, over 80 earthquakes have been detected in the area. Their origin is at 2 - 3 km depth. The two largest earthquakes in Bárðarbunga (northwestern Vatnajökull) since noon yesterday were 4.5 in magnitude at 18:55 (24 Dec.) and at 11:02 this morning (25 Dec.). Four more were over 4 in magnitude. In total, around 50 earthquakes were detected in Bárðarbunga. In the dyke intrusion 9 quakes were detected, all under M2. An overview map from Christmas Eve. The new lava is now 81 km² (80,6 km² + 0,4 km²) in size. Enlarge. Institute of Earth Sciences. The largest earthquakes in Bárðarbunga (northwestern Vatnajökull) since 9am yesterday were M4.5 at 11:35 (23 Dec.) and M4.6 at 22:23. Three more were over 4 in magnitude. In total, around 60 quakes were detected in Bárðarbunga. At the northern end of the dyke intrusion six earthquakes were detected, all under M2. The new earthquake sequence south of Langjökull, about 10 km northwest of Geysir geothermal field, continues. Around 50 earthquakes have been detected in that area since 9am yesterday. The largest was M2.5 at 01:11 this morning. They originate at a depth of 2 - 3 km. The largest earthquakes since 9am yesterday were M4.3 at 11:15 and 17:42 (22 Dec.). Five more were over 4 in magnitude. In total, a little less than 50 quakes were detected in Bárðarbunga. At the northern end of the dyke intrusion two quakes were detected, both under 2 in magnitude. The fires at Holuhraun were visible now and again on webcams yesterday. A series of small earthquakes south of Langjökull, about 10 km northwest of Geysir thermal area, has continued. Around 20 quakes have been detected there since yesterday morning. The largest was M2.2 at 09:19 (22 Dec). The Scientific Advisory Board of the Icelandic Civil Protection has held 80 meetings since the seismic activity started on the 16th of August. The Scientific Advisory Boards wishes all its' dedicated readers a Merry Christmas. Bárðarbunga: The largest earthquake measured the last 24 hours was M4.5 and occurred at 16:12 yesterday at the southern rim of the caldera. Three other earthquakes, over M4 occurred in the area. In total ca 30 earthquakes were measured in Bárðarbunga. Intrusive dyke: Ca 5 earthquakes occurred, all below M2.0. Other: Since midnight over 10 earthquakes have been detected south of Langjökull, ca 10 km west of Geysir in Haukadalur - the largest one M2.1 at 03:49. Bárðarbunga: The two largest earthquakes since noon yesterday were M4.4, both located at the northern rim of the caldera. A dozen quakes were detected between 3 - 4 in magnitude. All in all, about 30 quakes were detected. Intrusive dyke: A few earthquakes were detected, the largest M2. Thermal image from NASA & USGS 20 Nov 2014. The magma flow within the lava field has now reached the northeastern margin, at about 15 km distance from the craters. Some activity is still seen at the northern margin, but clouds obscured the western part. Enlarge. Institute of Earth Sciences. The magmatic controls on the sulphur content of flood basalt eruptions. There is evidence to suggest the sulphur output from older eruptions may have underestimated by several orders of magnitude. The lifetime of sulphur in the atmosphere which is critical for both the magnitude and scale of the environmental perturbation. These questions will be addressed through petrological analysis of the erupted rocks, measurements of gases and aerosol in the volcanic plume, as well as plume dispersion modelling. Bárðarbunga: No earthquake over M4 since yesterday morning but the largest were M3.6. About 10 were detected of size M3-M4. In all, about 55 quakes were detected since 10 AM yesterday. Dyke intrusion: A few small quakes were detected during this period (26 hours). Landsat 8 thermal image from NASA USGS from 18 December 2014 at 22:14. The lava is now 79.8 km² (79.4 km² + 0.4 km²). Enlarge. Institute of Earth Sciences. Bárðarbunga: The largest earthquake past 24 hours was of magnitude 4.8 in the northern caldera rim. A few quakes between magnitude 3 and 5. In total about 40 quakes. The dyke intrusion: Few quakes, all below magnitude 2. Bárðarbunga: The largest observed earthquake during the past 24 hours of magnitude 5.3 in the northern caldera rim. A few quakes were of magnitude 3 - 5. In total about 40 quakes observed. The dyke intrusion: Few observed quakes, all below magnitude 1.5. Other: Quakes are still observed north of Tungnafellsjökull. About 20 past 24 hours, the largest up to magnitude 3. About half of them occurred yesterday between 16 and 19 o'clock. An overview map from 17 Dec 2014. The lava has reached 79,4 km² (79,0 km² + 0,4 km²). Enlarge. Institute of Earth Sciences. Bárðarbunga: Only two earthquakes over magnitude M4 have been observed and over ten between M3 and M4. In total about 30 quakes. Dyke intrusion: Few quakes have been observed, largest M1.5. Other places: Yesterday and last night almost 20 quakes were observed north of Tungnafellsjökull, the largest M2.5. This area has been quite active since the onset of activity in Bárðarbunga in mid-August. Today, there are four months since the onset of the Bárðarbunga seismic events. Preliminary analysis of the decrease of seismic moment release and numbers of events with time has been done (see link). The situation is quite evident for the dyke intrusion (upper panels): The highest moment release is observed before the onset of the fissure eruption (red bar), i.e. while the dyke was growing, and the moment release in the dyke is now 10,000 times less than it was before the eruption (logaritmic scale on y-axis). For the caldera (lower panels), things are a bit more complicated, although a clear trend of decreasing activity is found there as well. Most moment is released during the week prior to the eruption. Smooth and steady decrease of seismic activity on the caldera rim is obvious, in spite of complications, and consistent with the general observation of a slowly fading activity in almost all other data sets. One more graph in the article shows how large earthquakes have become less frequent. A view from the north, a photograph and a thermal image, show that the bay into the lava, which has been present for a long time approximately 1.4 km from the craters, is now getting filled with magma. A lava channel, which directed the magma flow towards east, was situated above this location but it has now burst with the result that the magma flows due north and the bay gets filled. A fixed measuring point, a referral point in the bay, is now immersed. Photo: Ármann Höskuldsson. Míla's webcam and thermal image from a satellite confirm this north- or northwestern progression. According to the thermal image, the current magma flow also appears to be approaching the northeastern margin of the lava field but that progression is far away from the bay mentioned above. A magnitude 5.4 earthquake occurred at the northern rim of the Bárðarbunga caldera yesterday at around 09:30. It was the first earthquake above magnitude 5 in 10 days or since 5 December. After these large earthquakes occur, earthquake activity tends to decrease and only around 30 earthquakes have been detected in the Bárðarbunga area since, a few above magnitude 3. In previous days the number of earthquakes was 60 - 70 a day, several larger than magnitude 4 or around 20 (largest 4.8 on 13 Dec.). On 12 and 13 December, earthquake activity increased slightly in the dyke with around 20 earthquakes each day. All were within magnitude 2. The daily number of earthquakes since is, as before within 10 and all smaller than magnitude 2. At around 09:30 this morning an earthquake M5.4 was detected at the northern rim of the Bárðarbunga caldera. Ca 40 earthquakes have been detected in Bárðarbunga the last 24 hours, five between M4 and M5 and ca 10 between M3 and M4. About 10 earthquakes have occurred in the dyke intrusion. The eruption could be seen through webcams for a short while this morning but now it is snowing. A map from 12 December 2014. The lava free patch has finally been submerged, see yellow code. The lava is now 78,6 km² (78,2 km² + 0,4 km²). Enlarge. Institute of Earth Sciences. Same day, a radar image from ESA (Sentinel 1) of northwestern Vatnajökull ice cap, shows depressions and cauldrons in the ice above Bárðarbunga. Seismic activity around Bárðarbunga and the dyke intrusion has been comparably low in the last 24 hours. Bárðarbunga: Only three earthquakes were larger than magnitude 4 and none of them exceeded magnitude 4.1. In addition, nine events were between magnitude 3 and 4, a total of about 50 events were detected around the caldera. Dyke intrusion: Following a small peak of activity on Friday and early Saturday, seismicity in the dyke is again low. Only about 10 events have been detected, the strongest was magnitdue 1.3 this morning at 08:16. Eruption in Holuhraun: No visibility on cameras since about 01:15 last night due to weather. Since the last report yesterday morning (12 Dec.) seismic activity around Bárðarbunga has continued at similar high rates as before. Activity in the dyke intrusion has been slightly higher during the last 36 hours compared to recent days, however such variations of higher and lower activity are not unusual and have been frequently observed in recent weeks and months. The strongest earthquakes at Bárðarbunga have been magnitude 4.8 at 05:21 this morning in the northern caldera rim and magnitude 4.7 at 02:35 in the southern rim. Five additional events were stronger than magnitude 4 and about 15 between magnitude 3 and 4. A total of about 60 earthquakes have been detected around the caldera. No earthquake has exceeded magnitude 5 since Friday last week (M5.1 on 5 Dec. at 21:04 in the southeastern rim). This marks one of the longest periods without a magnitude 5 events and is in good agreement with the general slight decrease of activity that has been observed over the last months. However, on an absolute scale, earthquake rates and energy release remain at comparably high levels. About 20 earthquakes were detected in the dyke intrusion, the strongest was magnitdue 1.9 at 10:01 this morning at the northern edge of Dyngjujökull. While the last two weeks have been comparably quiet, a small temporary increase of earthquake rates has been measured since yesterday early morning, but activity has already gone down again. Small fluctuations of the seismic activity in the dyke have been frequently observed since the onset of the activity. Most earthquakes in the dyke in recent weeks were smaller than magnitude 1.0 and no event has exceeded magnitude 2.0 for more than six weeks. The eruption in Holuhraun continues with similar force as in the past days, however camera observations are limited since about 08:00 this morning due to bad weather around the eruption site. Minutes from the meeting of the Scientific Advisory Board (pdf 0.4 Mb). Insubstantial changes have been in the volcanic eruption in Holuhraun over the last few weeks. Indication show that the lava is now mainly flowing inside closed channels that open near the edges of the lava field. GPS measurements show continuing slow subsidence towards Bardarbunga. Telecommunications with the GPS station in Bardarbunga caldera have not been established yet. Due to bad weather forecast it is unlikely that scientists will be able to travel to Bardarbunga in the next few days. A connection will be established with the GPS station as soon as possible. Landsat 8 thermal image from NASA USGS yesterday. The lava is now 77,5 km² (77,1 km² + 0,4 km²). East of the empty patch there is now a glowing tounge of magma. Enlarge. Institute of Earth Sciences. Seismic activity around Bárðarbunga continues at similar high rates as in recent days. Activity in the dyke intrusion is low. The strongest earthquake since the last report yesterday morning was magnitude 4.6 yesterday at 12:40 on the northern caldera rim. Six additional earthquakes exceeded magnitude 4 and another 15 were in the range M3-4. All together around 40 earthquakes were detected around the caldera in the last 24 hours. Around 10 earthquakes were detected in the dyke intrusion, all of them smaller than magnitude 1. No visibility on cameras due to bad weather. Ca 10 earthquakes, larger than M4.0 have been detected at Bárðarbunga the last 24 hours. The biggest one was M4.4 at 19:58 yesterday evening. In total ca 60 earthquakes have been detected at Bárðarbunga since 10:00 yesterday morning. In the dyke intrusion both few and small earthquakes have occurred. This morning there has been no visibility to the eruption through webcams as there is blizzard in the area. The largest earthquake in Bárðarbunga the last 24 hours was M4.9 at 18:00 yesterday and it was detected in the northern rim of the caldera. At least two other earthquakes over M4 were detected at Bárðarbunga and ca 15 between M3 and M4. In total almost 100 earthquakes were detected in the Bárðarbunga area. Few earthquakes were detected in the dyke intrusion, all of them smaller than M2. At Tungnafellsjökull 3 earthquakes were detected and 5 at Askja and Herðubreið, all smaller than M2. An account of the first 100 days includes the number of earthquakes, GPS and gas measurements. The volcanic eruption that began in Holuhraun at the end of August is characterised by a large and an unusually steady flow of lava (Scientific Advisory Board 3 Dec.). The magma that comes up is a rather primitive basalt, with a chemical composition typical of the Bárðarbunga volcanic system. Petrology analysis of the magma suggests that it stabilised at 9-20 km depth, meaning that it cannot have resided at a shallower depth in the crust. The lava field is now over 76 km² in area. If the unrest continues in a similar fashion, the volcanic eruption in Holuhraun will continue for at least some months. This map shows the progressive extent of Nornahraun from 29 August until 14 November 2014. The map can be enlarged, revealing numerical values (km²) for the lava area at various dates. Based on SLAR images from the Icelandic Coast Guard. Coordinates and outlines: Icelandic Meteorological Office. The new lava field is the largest in Iceland since the Laki eruption (1783-1784 Skaftáreldar) and it is probably the third largest lava field on Earth over that period. Additionally, gas release from a volcanic eruption has had an impact all over Iceland for the first time in 150 years (see article with numerical values). The reason is the size and the long duration of the eruption. Even so; the map below where Nornahraun has been inserted between huge lava tongues from Laki, shows first and foremost the enormity of the volcanic events in the 18th and 10th centuries. Comparing the area covered by three volcanic eruptions in Iceland: Eldgjá in 934, Laki/Skaftáreldar in 1783-1784 and Nornahraun 14 November 2014. References: Eldgjá and Laki outlines and Eldgjá volume from Thordarson et al. 2001. Volume of Laki from Thordarson et al. 1993. Nornahraun data from the University of Iceland, Institute of Earth Sciences' Volcanology and Natural Hazards Group. Specialist: William Moreland. The largest earthquake in Bárðarbunga during the last 24 hours was an M4.6 at 20:57 last night (8 Dec.), located at the southeastern rim of the caldera. Seven more were above M4. In total, the number of earthquakes at Bárðarbunga since 10 AM yesterday is about 60. In the dike intrusion a dozen small quakes were detected. A few occurred at Tungnafellsjökull, the largest just under M2. The eruption in Holuhraun has been visible on web cameras this morning. Since noon yesterday, the largest earthquake was an M4.4 at 15:10 (7 Dec.) located at the northeastern rim of the Bárðarbunga caldera. Seven other quakes over 4 in magnitude were detected at Bárðarbunga and all in all about 150 earthquakes there since noon yesterday. About ten quakes were detected in the dike intrusion. At least one occurred at Tungnafellsjökull. Visibility towards the eruptive site in Holuhraun has been good this morning. About ten earthquakes of magnitude between M4 and M5 have been observed in the Bárðarbunga area during the past 24 hours. The largest quake was M4.5 at 10:38 this morning. In total, almost 120 quakes were observed during the past 24 hours, somewhat more than the day before. A few quakes were observed in the dike intrusion. The largest earthquake in the Bárðarbunga area past 24 hours occurred last night at 21:05, magnitude M5.1, in the southeastern caldera rim. A few quakes were between M4 and M5. Over 80 quakes have been observed since 10:00 yesterday. There is low activity in the dike intrusion. The eruption site is clearly seen on web cameras and the current activity is similar to recent days. The largest earthquakes in Bárðarbunga during the last 24 hours are four, all 4.3 in magnitude and all at the northern caldera rim. One occurred yesterday at 15:45 but the other three this morning. In addition, there were a few between M3 and M4. Like before, there is little activity in the dike intrusion. Visibility on webcams to the eruptive site is good and the intensity of the eruption seems unchanged. A field report of the Volcanology- and Natural hazards group of the Institute of Earth Sciences. Extract: Volcanic activity similar to what is was two weeks ago; with coherent signs of pulsative activity. The intensity of the eruption is decreasing slowly; however, it is still great and the ending is not in sight. The magma which creeps down to the sand plains north of Nornahraun is colder than the lava which has been measured earlier (thermal images). Plume pillows above the lava also indicate that there is less intense thermal convection; they are smaller and sometimes absent. All signs observed in the field seem to indicate that the upward flow of magma is diminishing slowly. Surveillance flight with TF-FMS, 4 Dec 2014. A short flight report with more photos is available. This one shows the eruptive site in Holuhraun; the fissure in front, the lava river behind. The dark patch is the new lava, which has no name yet. Witches' lava, Nornahraun? Photo: Martin Hensch. The largest earthquake detected during the last 24 hours was an M4.4 at 03:28 this morning. Four other quakes over 4 in magnitude occurred, mostly at the northern caldera rim. All in all, about 70 quakes were detected at Bárðarbunga. Activity is low in the dike intrusion. There is no visibility on web cams towards the eruptive site just now. In a long meeting today, the Scientific Advisory Board of the Icelandic Civil Protection reviewed data about the development of events in Bárðarbunga and the volcanic eruption in Holuhraun, from the beginning of the unrest until the present day. Most of the data show a decline in the subsidence of the Bárðarbunga caldera and the volcanic eruption on Holuhraun. Earthquake activity is however still strong and the flow of lava great in comparison to volcanic eruptions in Iceland for more than a 100 years. If the unrest continues in a similar fashion, the subsidence of Bárðarbunga and the volcanic eruption on Holuhraun will continue for at least some months. The situation could, of course, change and scenarios such as a subglacial eruption remain a possibility. Many more interesting points are listed in the notes from today's meeting. No earthquake above M5 has been detected during the last 24 hours. Four quakes above M4 occurred at Bárðarbunga, the largest was M4.4 at 17:19 (2 Dec) and about a dozen between M3 and M4 in magnitude. There is little activity in the intrusion. No visibility on webcams for the time being. NASA & USGS images sent by the Institute of Earth Sciences show the same features as described below, with a slightly clearer view; check noon 2 December and late evening 2 December. The last 24 hours two earthquakes, more than M5.0 have been detected at Bárðarbunga. The first, M5.2 at 12:52 occurred in the southeastern part of the caldera rim and the second, M5.4 at 02:18 in the northeastern part of the rim. Some earthquakes between 4 and 5 have also been detected. Ca 70 earthquakes (30 more than at the same time yesterday) have occurred at Bárðarbunga the last 24 hours. A few small earthquakes have been detected in the dyke intrusion. View to the eruption site has been good via webcams this morning and no changes have been observed. Thermal image from 1 Dec. shows considerable magmatic activity in the lava and in just over 24 hours it has stretched about 450 m to NNA through the new extrusion at the northeastern margin. West of the lava lake, the lava river now branches towards north. The southern margin is also active; a new extrusion seems to be forming due south from the lava lake and something similar is taking place just east of that. On this image, the plume appears like a brownish cloud over the middle part of the lava field and pillows of steam still seem to hover over the eastern part. Contrarily, the green effects are simply artefacts and tricks of light. Enlarge thermal image. Institute of Earth Sciences. From Dyngjusandur, northeast of the vent, at 14:41 on 27 Nov 2014. The top of the eruption column reached 3.1 km above Dyngjusandur, while the base of the aerosol-laden lower part of the plume reached ~1.4 km above the sand plain. Photo: Morten S. Riishuus. The lava extent is now just over 75 km², see map. 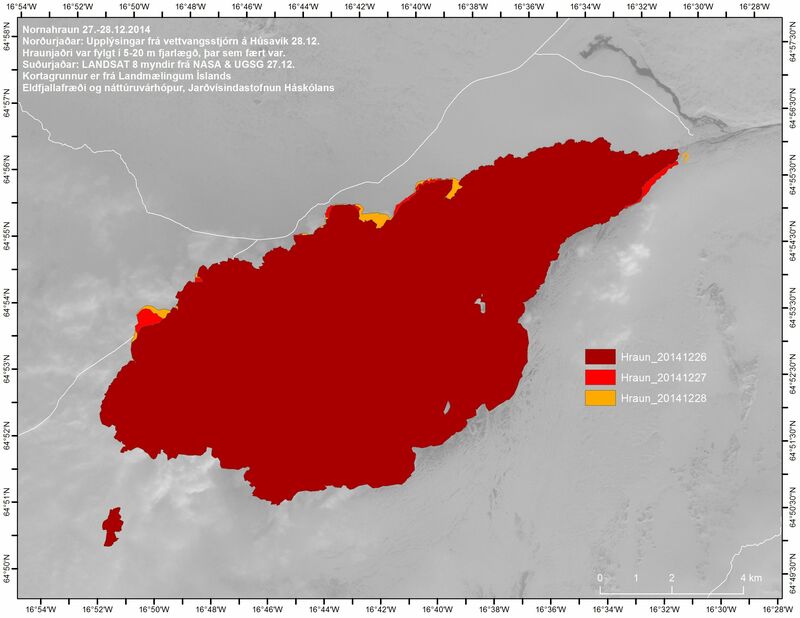 For comparison, outlines based on a satellite image since 25.11. are given and the northern outline based on fieldwork 27.11. Institute of Earth Sciences. The largest earthquakes at Bárðarbunga since 12:00 yesterday, 30 November, were M4.4 at 18:42 and M4.3 at 05:25. Over 40 earthquakes have been detected at Bárðarbunga the last 24 hours. Few eathquakes have been detected in the dyke intrusion but very strong wind has been in Iceland and in such situation it is difficult to detect the smallest earthquakes. Good visibility through webcams was to the eruption. The last 24 hours of images show no obvious changes in the size or intensity of the eruption. Observations from the month of November are found in another comparable article; including a recent discussion of the monitoring of the subsidence of the Bárðarbunga caldera and the latest earthquakes. This December article can be downloaded as pdf (0.84 Mb).